Two morning sessions and box lunch – $20 – registration required. Limit to first 35 registrants who receive a confirmation that they are registered. Email jocowriters@gmail.com to get your registration form. Registration ends March 31. 9 am – Session 1: “The Road to Publication: Professionalism, Publishing, and How to Present your Best Writing Self” with Stephanie Andrea Allen, Ph.D., Publisher and Editor-in Chief, of BLF Press, Clayton, N.C., an independent Black feminist press dedicated to amplifying the work of women of color. 10:15 am – Session 2: “How to Pitch Perfect: Query Letters, Pitches and Critique Partners,” with L. Diane Wolfe, owner and senior editor, Dancing Lemur Press LLC, Pikesville, N.C., dedicated to bringing outstanding and inspiring fiction and non-fiction to the publishing world. Noon – Box lunch – registration required. Afternoon session is free, open to the public. 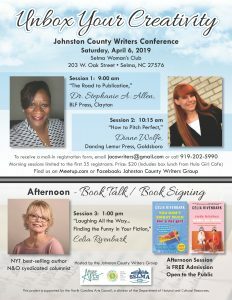 1:00 pm – Session 3: Book Talk: “Laughing All the Way …. Finding the Funny in Your Fiction,” with Celia Rivenbark, New York Times best-selling author of seven books whose weekly political humor column appears in newspapers across the country. The Book Talk is 45 minutes followed by a 15-minute Q &A session. Then Celia Rivenbark will sign her two most recent books (available for sale, cash or check only). This project is supported by the North Carolina Arts Council, a division of the Department of Natural and Cultural Resources. Registration required – limit to first 35 registrations received. Email jocowriters@gmail.com for your registration form. Please note the address is SELMA, not ZEBULON as printed on the map pin. The Selma Woman’s Club is at 203 W Oak Street in SELMA, one block off US 301/Pollock St, across from the Selma Public Library (that address is 301 N Pollock St).